Club Penguin Cheats by Mimo777 Club Penguin Cheats by Mimo777: New Mission and MORE Club Penguin Games & SECRETS Places! MIMO! THE CHRISTMAS DECORATIONS ARE GONE AT THE CLUB PENGUIN HOME PAGE, BUT THERES STILL DECORATIONS IN CLUB PENGUIN! hi mimo youre awesome waddle on! I hope they have another Music Jam, that party was was the best Mimo! I met Cadence about a thousand times that last party. How do you know that there are secret places? Also you know that you have a squid in that pic, well thats the squid in aqua grabber! Hey, I noticed in the picture there was a puffle...An orange puffle? I actually emailed CP about an orange puffle back in the summer, they said that they loved the idea! Maybe an orange puffle will come out in '10! And, maybe they will have a white EPF puffle! It can freeze stuff...Lol, just an idea! I am absolutely EXCITED for this next year for CP! I KNOW RIGHT?!?! I AM SO EXCITED! I LIKE ZEBRAS...WHICH IS TO BE EXPECTED! Thanks for updating us! I wonder what the polar bear will do this time ;) but whats up with the squid thing..? And I can NOT wait for the winter jam! Or is it music jam..? I hope the mission comes soon...I'm getting annoyed now, I've been waiting ages. I bet it is gonna be something really complicate and boring, like all cp missions. The new jobs sound cool, though. MIMO RULES! OMG MIMO THIS IS SOO SAWEET! But the bad thing is that most of the stuff is only for cp members. Ok, here are what I think all of the objects in the pic represent: The polar bear thingie is Herbert, for a new mission, the puffle is a new orange puffle, and the fish/squid/aquatic creature is either a new game or a thingie to catch in Ice Fishing. AWESOME! I am sick of waiting Mimo! WOW! Great glitch! I think Christmas Party gonna end today =( Soo sad, are you! Hey, I noticed that, too! Great eye, I hope Mimo gives you credit! I recognize that bear and squid! I saw that squid in the Aqua Grabber game a couple of time! Can't wait for the CP Winter Jam! For your poll, I voted the second one. I wanted free items. Anyways, Im a mem, so YAY for me. U rock so much, that I think that you are the best. Well waddle on Mimo. wow this is soo cool! FINALLY! I know that the certain polar bear is herbert from all of the missions, a puffle and maybe a jellyfish! idk lol! Maybe Herbert will come and take all of our puffles and then we'll have to solve a mission to find the puffles! I think that the missions are pretty fun...But yeah I agree that the member thingies shouldn't just be for members! But, hey, they gotta make $$ somehow, right? Oh, and only put (CPG Mod) next to your name when you are Modding! CP is kinda late to take down the decorations. They still have the hat postcards on. dude! i tottaly agree w/ u! winter jam here we come! but... they did say NEW event so maybe that means they're gonna make a NEW party! i hope its just not some lke random event thing like the medevil festival. but theres no other REAL events coming up except for new years so maybe its a new years party! to all u dudes and dudettes who say the decorations arent down yet, great job figguring that out! but the weird thing is... has cp ever actually waited to take the decor. for a party down? Yeah, I know. The party is still going on, and it's supposed to be over! mimo the squid looking thing looks like the squid that passes by sometimes in aqua grab game. Yea, loads of people hate member only stuff. Ok,its HERBERT,the gigant squid(OBIOUSLY!) and that puffle looks like a white one.SO i take by calcs that:New mission,job will be on Aqua Grabber and there would be an update of a puffle in another game,but the question is:What game and which puffle? It COULD be the white one! I know, it's so sad! But I think that it's super weird that Club Penguin hasn't ended the Christmas party yet... they just keep extending it. Maybe because of all the new memberships given as Christmas gifts... ? A new year's party would be cool! It would be SO cool if there were fireworks! I love fireworks! I don't like it, but I understand why they do it. I think that a lot of people don't actually think about why Club Penguin has member only stuff. They have to get people to want to pay 6 dollars somehow! Cool! Oh Mimo you know the blank banner on the light house? that you posted about well its not blank now. And there's a Coins For Change Concert! and Dance Floor up stairs Whoot! you rock Mimo! Ok, here's what I think. I reconizethe Squid from Aqua Graaber. Pufffles help you in games. And last, remember the code you get when you buy EPF? You'll get the missions from that HQ! So you'll have to buy the game- not be a member! Because it said there will be secret places in Club Penguin's post. Some more questions: Is the puffle siding with Herbert? If so, why? Are the puffles going bad? If they are, why? I met Cadence a bunch of times too. I love Cadence. Isn't she one of the best penguins? Or is it AA or Rockhopper. Trying to find them like crazy. I don't know how long you've been following CPG about the missions, but all three of those are going to be in the next mission that's (hopefully) gonna be here any day. Thanks for your input, though! Hey mimo777,U Fride,Me Santa ,Fever,And who ever els Cp is normal again!!!! Remember to only put CPG MOD next to your name when modding. Hope i helped. So do I! I hate member only stuffes! Non- rights! And thats why Im commenting and modding in BLUE! NON-RIGHTS and Happy New Year! I just thought about my first visit to CPG. I googled Clubpenguin Cheats, hoping to find where the new pin was hidden. The first 1 I clicked on was CPG. Everyday day, I checked back, but still, i continued to type CP cheats to find. Then I went to my first party! I saw Mimo and the gang!I saw how famous he was! I wanted to represent him. So, I started modding. Now, I'm a mod and i still ccome to www.clubpenguingang.com at least once a day! Yea, i love partys where you meet well known penguins. the christmas party is off in cp finally. thats sad. :( i can't wait until 2010's cmas party! mimo there is a glitch on english server. look for "Migrator"- it says "Migrateur". there is a pic of a puffle with a ? on it so i think there will be a new colour puffle! Cool ideas, i hope theres a new puffle! hey mimo im thinking about emaailing cp and asking for more stuff for non members.Im a member and i think non members should have more stuff to do. 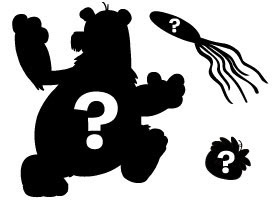 First of all, there's Herbert, that's NOT a rumor, then the Squid Rumor that you see in Aqua Grabber, and last but not least, the Golden Puffle.? I think that because there are ? marks on all of them, maybe a new level in Aqua Grabber? Mimo I think thats the squid from Aqua Grabber! haha you know whats dum mimo the robots were just toys!! there gone!!! lol! To answer your question Jimbay, in Operation Seek and Spy we saw Herbert had plans to do something to the puffles. I don't think the puffles will side with him. He may try to destroy them too. Hope that helps. I wish you a Happy New Year. I wonder about that theorie about the 2012. Will we be destructed?! Well U rock! Mimo the puffle will be the Brown Puffle cuz when you look at the logo of the puffle party there are some brown letters! I think the new room is gonna be the puffle training room in the dojo from the ds game and only the people who can get into the EPF HQ can get into the puffle training thing. I got a postcard from CP saying that there was going to be a new mission out today. I logged out, and when I logged in the next day, the postcard was gone! And I did get it, it wasn't a dream. Mimo! A sweet new Virtual World has launched like a couple of months ago. It does not have a lot of users, so we need your help! The Virtual World is called Kid Command. Look it up on Google. It has awesome graphics!! Hey mimo on the game fragger i made it to leval 30!!!!! Mimo all them high scores arnt real! My friend found a bug on FIssion-balls and found a way to make high-scores bigger...all he has to do is just type in a name and random numbers! Do you know how guilty I feel in you thinking that I got 1st place in fission-balls, when my friend just made me 1st with this hack? Not bad, not bad. that would be so cool to catch that in Ice Fishing. An orange puffle would be awesome too! Glitches, glitches glitches. CP FIX YOUR GLITCHES. That is all I have to say. Didn't they have the music jam in the Summer? Either that or time is going by fast. Maybe they will have a new Aqua Grabber level! And he said there were new rooms-places b/c he looked at the CP blog and it said that there. I just emailed CP for them to try to consider patterned penguins. Like polka-dots. Of course becuz my name is Polkadotblu9. If CP ever does that thank me! Maybe that Squid is a Box Kite lolz! New year party I think. well im happy cuz i got a six month membership and epf for christmas so i think i know what might happen. The Bear Symbolises Herbert! A New Mission Might Come Out! The Squid Represents Aqua Grabber, It's A Mini game! A New One Might Come Out! Waddle On Penguins! Don't Be Too Exited! You Might Faint! I don't know. But they did say new games. MIMO!!!! (and everyone else) WHAT IF THE SQUID HAS SOMTHING TO DO WITH THE ICEBERG TIPPING? well? do you think I have a point... what else would the squid be for? it IS in the game aqua graber! Well More Members rooms gives club penguin more money. Whoa, you're right! Mimo should post that, hope Mimo gives you credit! Well a lot of people hate that but that's how club penguin get's more money. So when they do that stuff more people want to become a member and no that's not a stupid way of earning money. It's really called the "Holiday Party"
Yes! I love parties where you can track famous penguins! P.S Mimo's Tracker is the best!! Club Penguin highlights them so you know what the new music is! Same Here. I think it's the squid from Aqua Grabber. This is not considered as a glitch. The word "Migrator" is pronounced Migratuer on French Servers. LOOK! If you turn on your Fire suit and you dance, you control the fire! A Fire Ninja Penguin could use fire when its wear the suit. Just wave or dance and fire will come near the penguins. CP usually only does fireworks on New Years. MR.FREEZE FROM NEXT DOOR!!! Lol! What's that thing in the top right of the picture? A Jellyfish? Lol! And a rainbow puffle, or a orange one, or a zebra one, or a penguin puffle! Not so lol. :| I can't wait for 2010!!! And guess what? Yeh people who live in the UK get 2010 earlier! Becuase of the different time zones! Lol! Huh... New games+new places+new mission=pure awesomeness!!! Waddle on!! herbet is the polar bear, the orange puffle, and the squid from aqua grabber. I've always wondered why its there. The new game and mission sounds awesome. I hope its all for nonmembers, atleast until i get another membership card. True but it's a scam of Club Penguin Planet Cazmo Chobots and Webosaurs. But it's just all about going to diffrent places doing missions about saving the earth. I don't think it's fun but the graphics are awesome!! I think that the 2nd annual Pengui Games is coming up like last time because of the Olympics. I am sure he will forgive you. It is just a game right? if this is the worst thing you have ever done you are sooo lucky! PS I have done worse. An email once sent to my homeroom teacher that wasn't supposed too! Ok well i reken herbet kidnapes a eleit puffle(he doesnt no its an eleit puffle he just sees puffle coming out of hq)then creates a robot puffle that acutlly has a camera in it then herbet finds out about eleit force then comes to break in to it but we find out about it then we host a costume party in the eleit force place to trick him that he has gone to the worng place then when he turns around to leave he catch him! the reson the squid is there is because klusty leaves him so the new squid dude is his new side kick! i think that the puffles will side with herbet cuz thry dont want to be pets too all p[enguins and will rebel! For the mission if you do the mission, you get EPF Badges that you can wear as pins!! Great observation! i didn't notice that but i hope mimo gives u some Credit. Mimo goes on cp all the time without having a party. Where do you think he get's all these cheats without the cpg? Remember that Mimo is only one penguin so seeing him is not a very big chance which is why you probably don't see him. He looked at the clubpenguin blog. cp highlights the new loo music so you know which ones are new. Dude i already toldhim that. Please give mecredit mimo, and please post about it! Feel your pain. And lets have a protest if club penguin has ANOTHER member only thing! It's RIDICULES! Hey Mimo! Did you notice the post says new JOBS? maybe we could train puffles, like in the DS game. That would be AWESOME! that was in the cp blog go check it out! MIMO! i got to tell you this: ok that polar bear is herbert.p.bear and a new mission and the squid...maybe the new mission is about the aquagrabber too? and a puffle... mayby theres a puffle underwater (that herbert traped) and herbert uses a squid to keep it there till the agents come but it is a trap???? Hay mimo! awesome sneek peek! but i have a theorie to all of them! 1.polar bear, i think that means that there might be a end to herbert in the next mission! 3.puffle, i think theres gonna be a new type of puffle, theres loads of coors to pick! like a orange, brown or maybye even aqua! coz if u remember that color vote back i july the winner was aqua, is that maybye a hint? none knows! Great ideas I would love there to be and Elite Penguin Force! Also a secret place would be brilliant and If there was a new game that would be nice! And testing skills that sounds good! Jobs and mysteries sound interesting! And that certian polar bear will he be part of the new mission and do you think that the new mission will be for Elite Penguin Force! Yes the winer party should be on club penguin soon! And a new event I wonder what that could be! I have been emailing club penguin and what is that puffle in that picture because I was emailing them about new puffles! ALso I emailed them about new things so could it be to do with my emails! Hey Mimo, I Can't wait for the mission and also there is a new color puffle coming out!! its herbert the polar bear, a puffle, and a squid. Haha! ----------------------------------- Yeah are very fun and when gary was on. I think it would be soo cool if..
this was an altogether different bear. Perhaps a girl bear, name Klondi or something. She would be a special agent who is helping HQ agents rid the island of Herbert's mayhem. Maybe they used to go to school together(Iceberg Academy) and were the best of friends at one point. That is, before he took an iceberg out in search of 'warm' horizons and made a mean turn. She misses their friendship and would like to be friends again, if he changes his mean ways. Deep down he misses her and back home and actually starts behaving...at least for a while. OR, it could be his Mom or Granny bear, who came to try to get him to behave himself once she heard how he was rudely disrupting CP peace. Often blurting out random things about his childhood/past that make him look not-so-tough(blush). Now he feigns behaving to avoid the hilarious lectures, but now even more determined in his fiendish pursuits. Sure, none of this may ever happen. In either case it would be cool to see Herb a lil conflicted about his choices sometimes. It would be a nice way to introduce a 'Search and Find/Tracking' sort of game with Herbert. Like a mix between the hidden pin and Rockhopper appearances sightings except it would be Herb once or twice every two weeks or more random. It would keep things fresh if he actually appeared on cp island sometimes for us to spot. We could like have a thing on our card or something that shows how many times a player located Herbert. So you want good news or bad news for me! If you move your mouse over the picture on the what’s new blog it says Herbsquidpuff.jpg It seems likely that Herb is Herbert…puff is puffle but what is the squid?? Please credit my blog if you post, thanks! I think the new mission is about herbert trying to steal puffles or/and/with(using) squids. Or a new game about puffles or/and squids. Ps: sorry about the /. Mimo you should tell Club Penguin that they need more non-member rooms and parties! And I also don't get... where is the new MISSION!? I think I know what they mean. The Squid means a NEW level of aqua grabber. The puffle either means a NEW puffle or a NEW game to do with puffles. Herbet means a new mission/missions? what is the squid doing there?